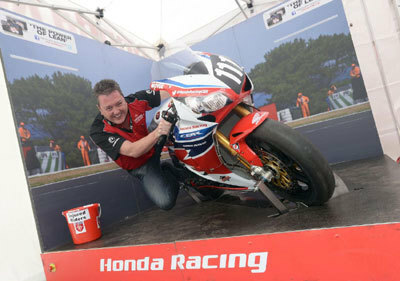 Racing fans attending the 2014 Isle of Man TT will be able to experience Honda's famous 'Power of Lean' race-bike simulator and be in with the chance of winning exclusive on-the-spot prizes from the Honda Racing team, including caps and TT programmes signed by John McGuinness and Conor Cummins. For TT race week, the Power of Lean will feature the stunning Honda Racing CBR1000RR Fireblade SP machine run by the team in the 2014 World Endurance Championship. Visitors to the TT paddock can climb aboard and experience the lean angles enjoyed on track by Honda Racing's EWC riders Freddy Foray, Sebastien Gimbert and Julian Da Costa. The Power of Lean is the perfect opportunity to capture a memorable photographic souvenir, but several lucky race fans will also go home with a piece of TT memorabilia signed by John McGuinness and Conor Cummins. Power of Lean visitors are invited to upload their images to Facebook or Twitter and share them using the hashtag #PowerOfLean. Images will automatically be uploaded to a special gallery at hondaproracing.com/poweroflean and the most stylish rider – as judged by McGuinness and Cummins – on each day during race week (Saturday 31 May to Friday 6 June) will win a prize. The winner on each day will be contacted by the team via Facebook or Twitter and invited to collect their prize from the Honda Racing truck.